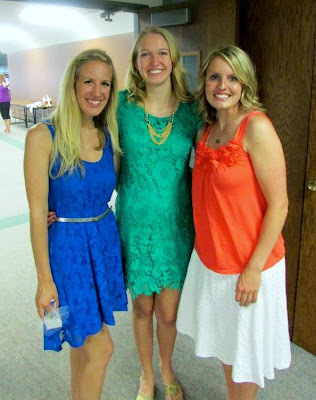 Quite a few of my friends are expecting their first (yay!) and I always like to send them my registry favorite lists...but I couldn't find it! :( So I decided to post it online. 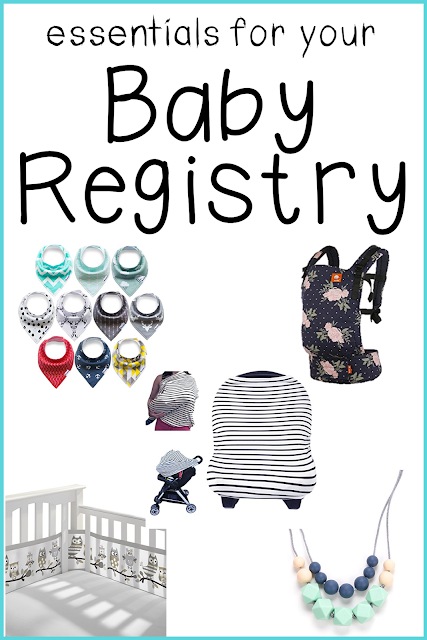 There are so many different things you can register for, but honestly, baby doesn't need that much. A 360 nursing cover is a must!! 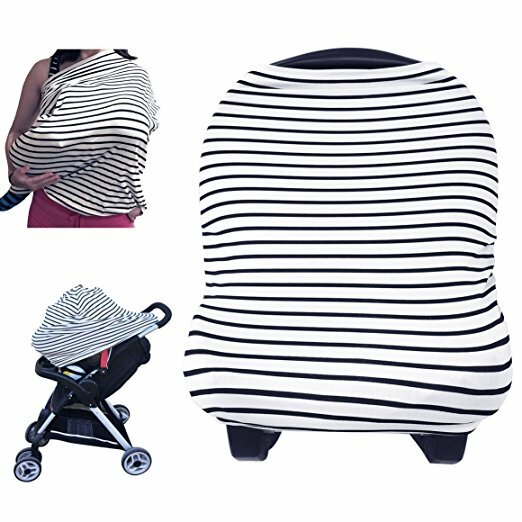 I love how easily it fits in the diaper bag, and can be used as a carseat cover, shopping seat cover, and of course a nursing cover as well! I liked this for nursing because I felt completely covered and it was less awkward than the front-only covering ones. 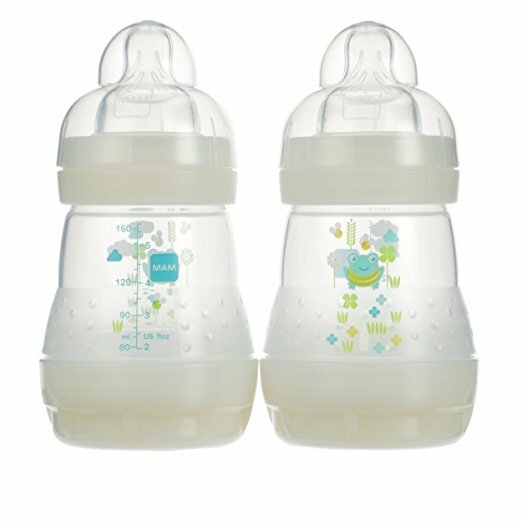 Breast Pump: get one through your insurance, it should be free or close to it! Nursing pillow: The bobby is so popular, but I found it flimsy. I guess I'm high maintenance. I liked the mombo pillow as it has a firm size and a soft side. Also, My Breast Friend is amazing! Bottles: Gavin didn't use them that often, but the mam bottles worked well for him. It might have helped that his pacifiers were the same brands. Pacifiers: The mam brand pacis were the absolute best for us! And I love their glow in the dark ones for nighttime. They glow all night long, so nice when you are searching for one in the dark! 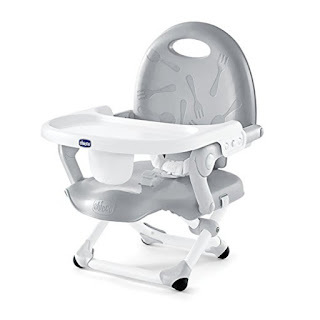 Portable high chair: My friend has this one, and I'm jealous ;) so I might have to get it for baby #2! So compact and easy to use! 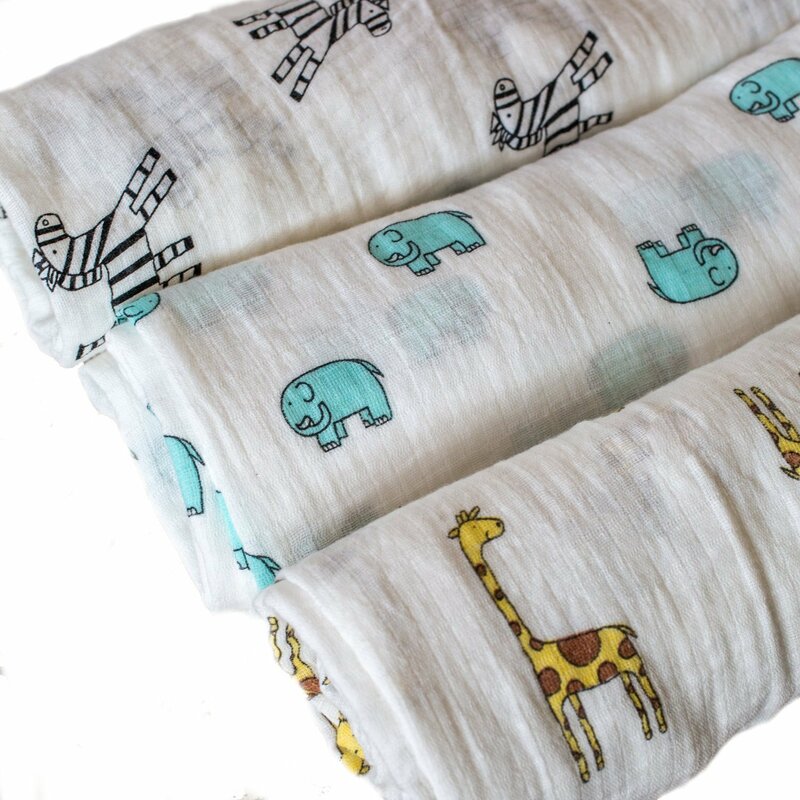 47x47 cotton muslin swaddles: Everyone loves the Aden and Anais brand, and that's what we got. But I've tried others, and they are literally all the same, so just go with whatever patterns you like best! 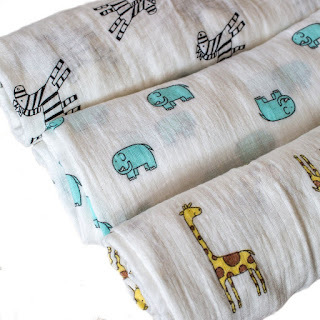 (Most swaddles are 44x44 and the extra 3 inches made all the difference for me! I had 44x44 swaddles that I got brand new and 47x47 swaddles that I found at a thrift store...and couldn't figure out why I liked the thrift store swaddles better, until I realized it was because the size was different! 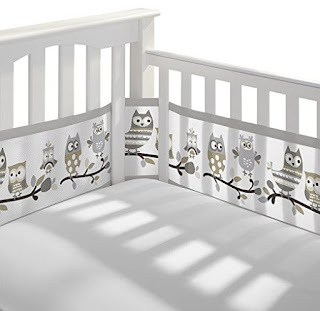 Crib Sets: The crib sets with the comforters...so not needed. You won't use that comforter/quilt! Bumper pad: Technically, I don't think these are recommended but I especially loved having one to make sure the pacis stayed in the crib! Lifesaver! I really liked the ones from breathable baby, because I felt like it was totally safe. I love these neutral owls or this woodland theme ones! They have solids too. Crib sheets: Make sure they are 100% cotton! Surprisingly, I got some from Breathable Baby that went with our bumper pad and later found out they were 100% polyester. :( Cotton is so much better for babies. Black out curtains: Because everyone sleeps better in the dark. Nightlight: Sounds counterproductive, right? But you'll want a nightlight if you're nursing at night, you need to see at least a little bit! Chico Key Fit 30: It's the most popular, so we went it and we liked it! Graco Extend to Fit: Perfect convertible car seat. We also liked the milestone or All-in-One by Graco too. Stroller: I'm the weirdest person I know as I didn't like big strollers. I also just didn't like strollers in general. So I found I prefer umbrella strollers. But, everyone I know loves the City Select stroller, get both seats right away! 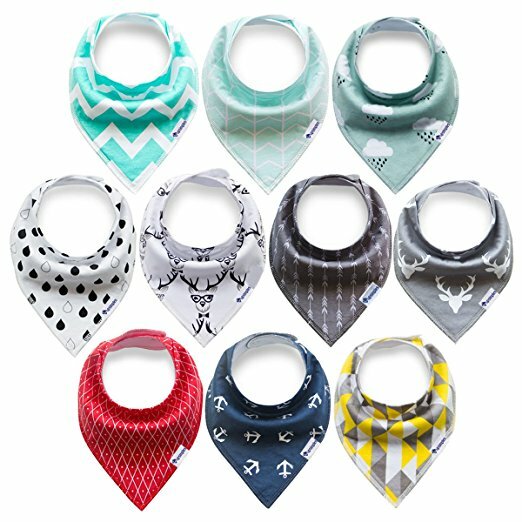 Bandana bibs: Gavin was a drool monster! Seriously soaked through his clothes in minutes. These bandana bibs were our favorite because they were so absorbent, his shirt stayed dry, and they were cute too! Snot Sucker: Sure, it seems gross, but the nose frida really does work the best, so much better than the bulbs. Teething necklace: This one is for you to wear and baby to chew one! I had one where the beads went all the way around, you don't want these on your neck. 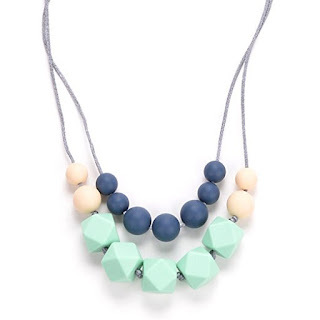 Make sure to get one like this with beads just on the bottom. It was great to wear to church and always have something to easily entertain baby with! Carriers: I'd recommend both a wrap, such as the Solly wrap, and a carrier such as the Tula or the Ergo. 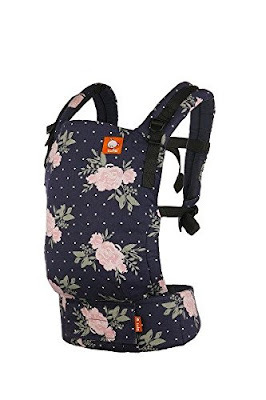 (I actually have a Boba carrier for my buckle carrier, but I got it instead of the Tula because it came with an infant insert, however, now knowing I prefer the wrap when they are little I would go with the Tula instead.) 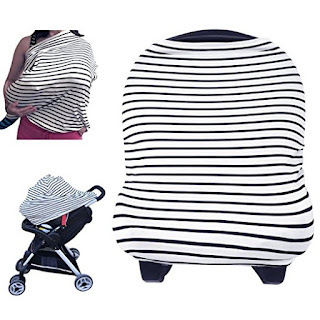 The wrap was my favorite because it was very comfortable for me, and also nice because you can use it from birth. But my husband definitely preferred the carrier. And when they get older, it's nice to be able to wear them on your baby, which you'll want the buckle carrier for. I'm sure I'm missing quite a few essentials, but I hope that helped get you started! In case you haven't noticed, this will be the first post since August! I LOVE blogging and sharing my crafty and DIY ideas with you, but I am finding I don't have time and motivation for it this year. I am focusing more on my special education blog, Breezy Special Ed, so if you are interested in special education, feel free to follow me over there! Oh how we love this little puppy! I found this cute bottle opener / wine cork set at a garage sale. 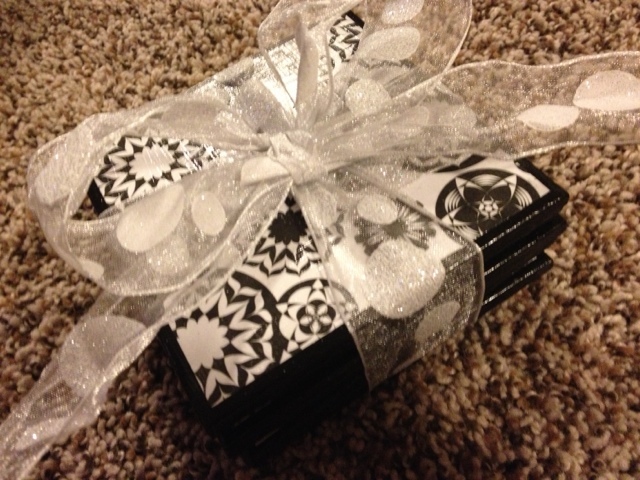 And knew there was a themed present to be made! Add a nice bottle of wine (I chose a pink moscato from Trader Joes) and some homemade coasters and it all makes a great combination. 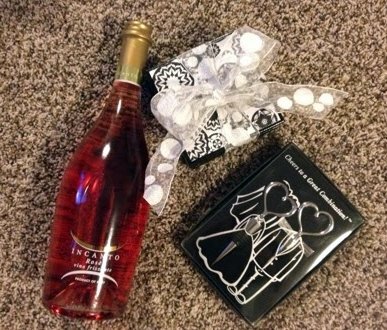 I thought about getting their wine glasses (or at least some of them) off their registry, but they had already been bought. Also, you could get a pair of wine glasses and etch "Mr." and "Mrs." on them to complete the gift. Wouldn't that be cute? Basically, the tiles are 4x4s from Lowe's for 20 cents each, I cut out scrapbook paper and mod-podged them to the top and did a few more coats over the top, and added black felt to the bottom. If you have any questions let me know, but they are super easy to make! You could easily make them personalized by using photos or by adding a monogram. 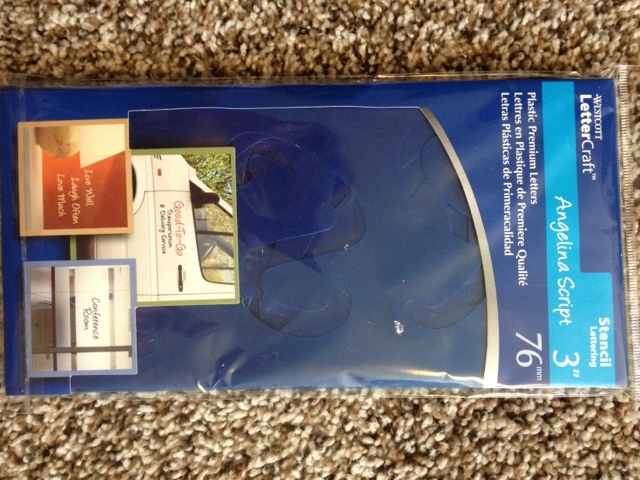 (However don't print something out and expect to use it with mod podge - it probably won't work). Seasonal Blocks - a word for every season! Anyway, they are super cute and they can spell a variety of words because there is a letter on each of the four sides. So you can leave them up all year if you want to. 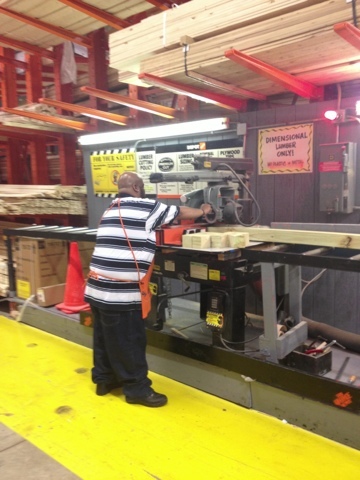 I went to Home Depot to get a large 4x4. And then I had them cut it into squares. TIP: A 4x4 post is actually more like 3.75x3.75, so measure first to know what size the cuts should be in order to make squares. I now have a gazillion blocks. And you only need 7 blocks for this project - so I will be coming up with more creative ways to use them soon. I painted my blocks white with some leftover wall paint. The wood really eats the paint up, so spray paint is not your best option. I also used leftover wall paint for the letters. Then I thought about cutting out letters with my cricut, but that seemed like an awful lot of cutting and placing to do, so I bought a pack of 3 inch stencils instead! They worked well. I watched about 8 episodes of Cake Boss on Amazon Prime while stenciling away. 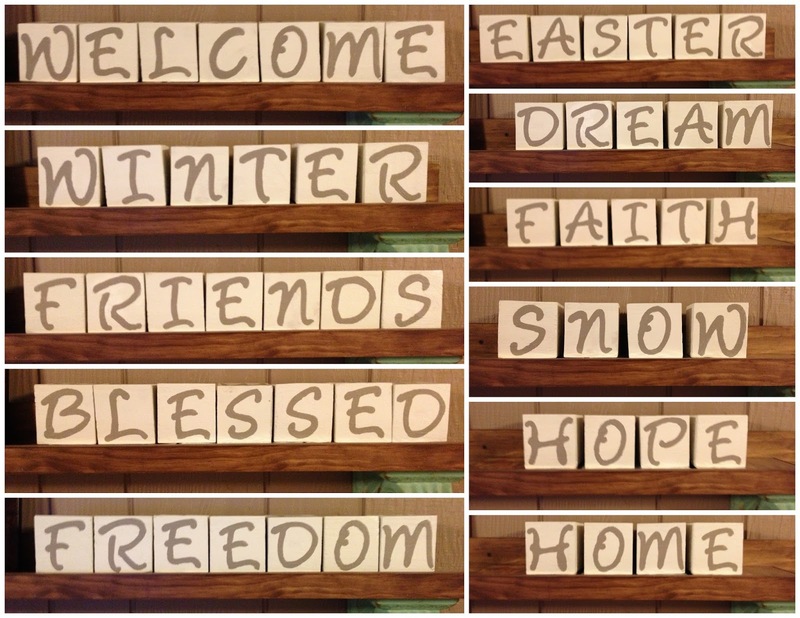 And here's a few of my favorite words! How fun is that? Go make them and then show me how they turn out!